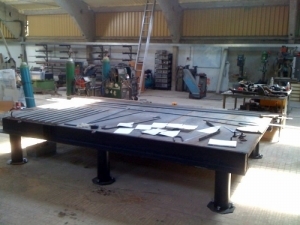 Homemade welding table featuring a top fashioned from three 2.5x1.25m plates laid side by side. Legs cut from 7" dia tube. Main beams are 10"x10". Weighs 2 tons. Size: 2.5x3.75m.